Margaret Keane wore this dress when she married Patrick Curran at the Milton Catholic church on 7 August 1883. She was born at Oranmore, County Galway, Ireland in 1858 and emigrated to Otago on the Margaret Galbraith in 1874. She was a nominated migrant and travelled with three other Galway girls, also nominated for assisted passage by someone in Otago. As domestic servants they would have been employed as soon as they arrived off the boat. Margaret worked for almost ten years before she married Patrick. He was from Dublin and had also arrived in Otago in 1874. After their wedding the couple settled at Milton, where Patrick worked as a labourer. They celebrated their Golden Wedding in 1933. They had four sons and four daughters but one son, two daughters and Patrick all predeceased Margaret. She died in 1942, aged 84. 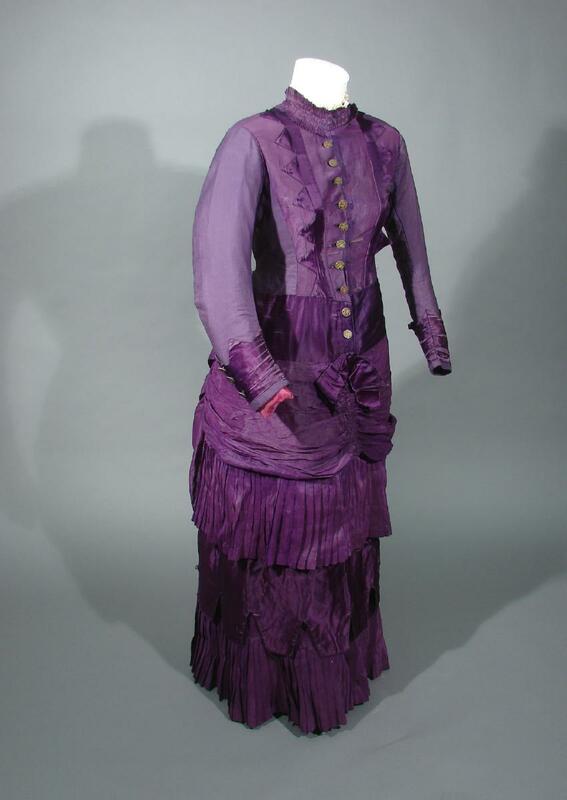 This dress is striking in its bold deep purple colouring, combining silk and cotton, and plain and satin weaves in the same colours. The material is unpatterned but there is extensive decoration using pointed ‘vandykes’ on either side of the central panel and above the sleeve cuff. A satin bow sets off the swathed fabric in the centre of the skirt and this is drawn back to the sides and rear where the bustle sits at the higher position fashionable by the mid-1880s. The collar is ruched and lined with organdie. The buttons feature a bird motif. There are three flounces on the skirt, a pleated one at top and bottom off-set by a middle section of satin in the vandyke pattern. The satin fabric is threadbare in places, which suggests it may have been a poor quality material. Numerous signs of wear indicate that the dress was well used after the wedding in 1883.